You choose this program not only for its brand, alumni network, and academic excellence, but also for the relationships you build. 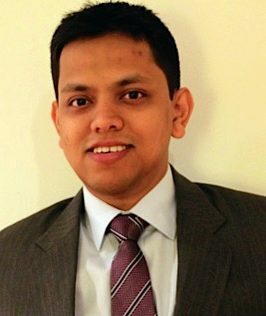 Pushpak Das Purkayastha, manager of management consulting at PwC in New York City, came to Wharton’s MBA for Executives Program to gain a formal business education and further his consulting career. After looking at several EMBA programs, he decided that Wharton was the best fit. We asked him to tell us about that process as well as his experience at Wharton so far. I was fortunate to have alumni from many top MBA programs at my firm and those individuals were eager to share their experiences. Based on those interactions, I realized that the Wharton program offered everything I was looking for. The residential requirement and rigorous curriculum really stood out. The opportunity to get to know my classmates outside of class on Friday nights can make a big difference in strengthening bonds and learning from other industry experiences. Even alumni of other schools recommended the Wharton EMBA Program based on their interactions with high-caliber Wharton students and alumni. Some even questioned the point of investing so much time and money in an executive MBA if it wasn’t from Wharton. I agreed, as this wasn’t a check-the-box exercise. I didn’t want to be associated with a watered-down MBA program. When I started the conversation about sponsorship from my company, it wasn’t an easy process. There was an understandable concern that I would be distracted from my client service work, disconnected from work every other Friday, and potentially leave the company after the program. Though my loyalty to the firm and my high performance gave them some assurance, what made the difference was the Wharton program itself. We had Wharton graduates in our practice. The partners saw how the direct exposure to the Wharton community and education had enhanced their performance and, most importantly, helped them add value in their client and staff interactions. So when I told them I was only targeting Wharton, they were happy to support me. They agreed that the knowledge and experience gained at Wharton would continuously pay dividends to the growth of our practice. 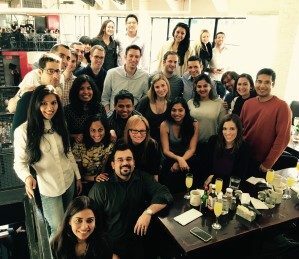 A big highlight of my first year was my learning team, which we called the “Dream Team.” We were extremely diverse with members from different parts of the world: U.S., France, Russia, China, India, and Sri Lanka. Everyone brought different skill sets and capabilities to the table, and we had different styles when it came to solving problems and responding to case studies. Yet, we were all based in New York City and spent many late nights working together. Those interactions were invaluable. We’ve become a support system for each other as well as lifelong friends. One of our teammates is getting married to another classmate and we are all heading to their wedding in France after graduation. The learning that results from the diversity of students was another big highlight. It’s said that diversity of thought helps to solve many business problems and I’ve seen this multiple times in action at Wharton. For example, one of my classmates working in a disruptive health care startup shared a problem during lunch. It was related to developing a new market entry strategy in health care. There were four of us at the table from different industries. Each one of us came up with a fully feasible solution based on our experience and skill sets. My classmate was amazed to find four solutions to a problem that he had been working on for two weeks. These experiences show the strength of the program and the capabilities of the students. A big challenge can be managing expectations. There have been times when it’s extremely difficult to be out of the office on Fridays. Some of my clients have felt that I was on “vacation” every other week. Fortunately, I identified junior staff on my team who could step up to fill my position when I was out. They found this to be an excellent opportunity to develop and demonstrate their leadership skills and it helped me to hone my coaching skills. I also found a few key influencers in my client network who went through similar executive programs and have supported me in my endeavor. This program is not for the faint hearted. We live life in two-week intervals. The two weeks between class weekends feels really short as you go through multiple class assignments and readings. But you become an expert at prioritizing and time management so you do get to a point where it doesn’t feel as stressful. You also have the advantage of getting your full schedule at the beginning of each term. This includes readings, exams, and assignment details so you can plan ahead. Every Saturday after I return from class, I look at all the readings and assignments due before the next class weekend and chalk out a plan for the next two weeks. I am able to actively apply the lessons from class to make a direct and immediate impact on both my client service delivery and business development capabilities. For example, after learning how to develop and interpret simulations in my first year, I was able to build a model to forecast a client’s expenses in its portfolio of initiatives for its annual budgeting process. Also, after taking marketing classes, I was able to apply newly learned methodologies to develop a market entry strategy for a European private equity client. You choose this program not only for its brand, alumni network, and academic excellence, but also for the relationships you build. Seek opportunities to step up and deliver above and beyond to make it an unforgettable experience for all. If you are a great team player, you will never find yourself alone in this journey. Also, your classmates are your eyes and ears in the professional community. They will help you to expand your professional network and connect you to interesting career opportunities. This is a transformational experience so try to make the most of it. There are multiple opportunities to get to know classmates and develop friendships. The residential requirement makes it easy for everyone to connect on Friday nights. Some of my classmates regularly organize dinner at local restaurants. We also have numerous events organized by the Wharton staff, such as Halloween, casino night, and a trip to the aquarium. Family members get to know each other during special family days. We develop strong bonds that will last forever. As one of my classmates said, joining Wharton is like joining the league of extraordinary individuals. Assistant Systems Engineer at Tata Consultancy Services Asia Pacific Pte. Ltd.